Bisbee (Cochise County, Arizona) Deep blue color with smoky black matrix. Candelaria (Northern Nevada) A small depleted (closed) mine. Stones have luminous quality. Carico Lake (Lander County, Nevada) Blue and green. Cripple Creek (Teller County, Colorado) Green and blue with brown matrix; by-product of gold mining. EASTER BLUE An old Nevada mine owned and operated by Danny and Dean Otteson. It is located in Nye County near the Royston turquoise area. In was opened in 1907 and produces turquoise from surface and underground mines. The turquoise is hard, of fine quality and a rich blue color with beautiful matrix. Fox Turquoise mine (Lander County, Nevada) discovered in the early 1900’s, was once Nevada’s largest producer of green or blue-green turquoise with a distinctive matrix. 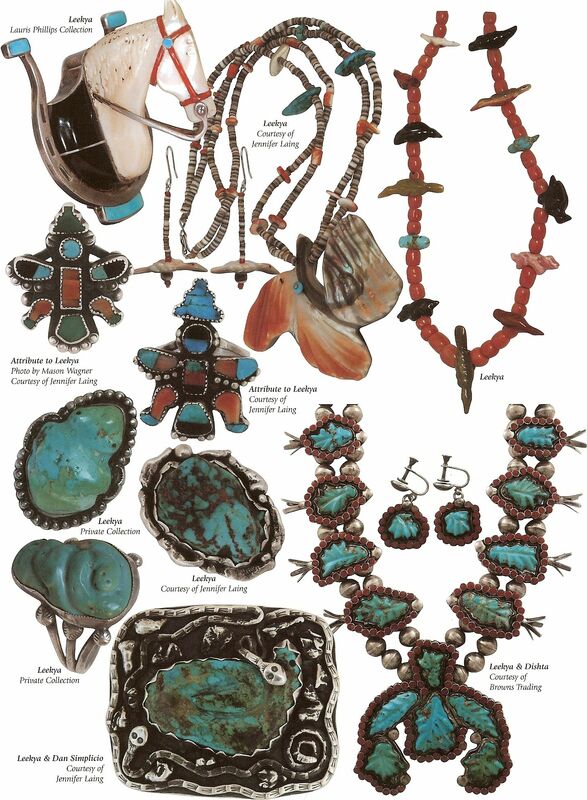 The different sites of Fox deposits were developed using the names of Fox, White Horse, Green Tree, and Smith to differentiate among the colors of turquoise produced. The Fox mine is now closed. Kingman (Mohave County, Arizona) Blue stones with white matrix sometimes dyed black. King’s Manassa (Conejos County, Colorado) is best known for its brilliant greens and golden and brown non-webbed matrices, but blue and blue-green stone is found there as well. This site, east of the town of Manassa, was originally mined by Ancestral Pueblo peoples. It was rediscovered in 1890 by gold prospector I.P. King, and his descendants still work the claim. Lander Blue (Lander County, Nevada) The rarest of all Southwest US turquoise; high grade and most valuable. Lone Mountain (Esmeralda County, Nevada) Deep blue stones with fine spider webs. Morenci (Greenlee County, Arizona) Blue color with “Fool’s Gold” (iron pyrite) matrix. Number Eight (Carlin, Nevada) Exceptional spiderweb turquoise with the matrix ranging from golden brown to almost black, but a deep golden webbing is most characteristic. Royston turquoise mine district (Nye County, Nevada) consists of several mines including Royston, Royal Blue, Oscar Wehrend and Bunker Hill. Discovered in 1902 it is the oldest patented mine in Nevada. Royston turquoise is known for its beautiful deep green to rich light blue colors in the same formation and the stones are often two-tone, displaying both dark and light green and sometimes blue. It has a heavy matrix ranging from dark brown to gold in color. 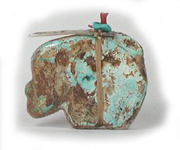 Royston turquoise is considered very collectible. Sleeping Beauty (Globe in Gila County, Arizona) Uniform blue turquoise that is easily matched and cut. Often clear but sometimes with white matrix that is dyed black. Pilot Mountain (Esmeralda County, Nevada) Blue and green stones with dark brown, reddish or black matrices. Turquoise Mountain (Mohave County, Arizona) Blue and green. Stormy Mountain (Elko County, Nevada) Dark blue with black matrix looking like blotches. 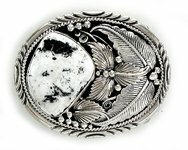 White Buffalo Turquoise or White Buffalo Stone is not turquoise at all, but a different stone that is white stone with black and brown inclusions. By definition turquoise contains copper (it is a copper aluminium phosphate), which is what gives the characteristic blue color. Presence of iron will shift the color toward green. “White turquoise” without blue color is technically not turquoise and is more accurately called White Buffalo Stone. As far as we know, White Buffalo Stone comes from only one mine in Nevada, which is owned by the Otteson family. Howlite is commonly passed off as White Buffalo Stone. The Zuñi believe blue turquoise is male and of the sky and green turquoise is female and of the earth. Hopi legend tells of the lizard who travels between the above and the below, excretes turquoise. This stone can hold back floods.